In an age when many households are veritable kinder-doms, and teenagers have become a major market force, many parents feel confused by the sturm, drang und hyperactive telephone use of their teenagers. 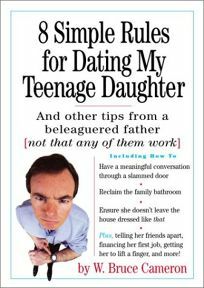 Here to help fathers stay afloat during their daughters' adolescence is humor columnist W. Bruce Cameron with 8 Simple Rules for Dating My Teenage Daughter, and Other Tips from a Beleaguered Father (Not That Any of Them Work). In a chapter called ""It's Her Party and I'll Cry if I Want To,"" he explains that teen parties are unnecessary because ""[y]our daughters do not need to be made any more excited than they already are. They do not need to meet or dance with boy particles."" If nothing else, the book will prove a welcome distraction.